Crawford River is located in the Henty winegrowing region on the Upper Hotspur Road between Hotspur, on the Casterton/Heywood Road and Condah, along the Henty Highway, half way between Hamilton and Portland. The winery is less than an hour from Port Fairy, Dunkeld, Portland and Mt. Gambier in South Australia. The beautiful cellar door building added in 2000 was designed by Graeme Gunn. Visitors can drink in the glorious views of the vineyard that sweep down to grazing cattle and sheep as they sample the wines. Situated approximately 50 kilometres inland from the Southern Ocean and lying at the alluvial edge of a volcanic lava flow, the 11.5 Ha vineyard has its roots in an unusally complex, mineral- rich soil base. Gravelly, friable, basalt loam overlays permeable clay which lies above limestone created by an ancient, risen seabed. Rainfall is generally reliable, with much of the 650mm average falling in Winter and Spring . At Latitude 38° South and 110 metres above sea-level, temperatures are cool. All wines are crafted entirely from fruit grown at the Crawford River vineyard, vinified and bottled on site. The hand picked grapes are brought in to the winery in small batches where meticulous attention is paid to detail. Patience and time are of the essence throughout the winemaking process. Minimal interference and movement during vinification, in preference of the fruit naturally expressing the special terroir. This approach influences the pure, elegant quality of the end product. White wines are cool fermented to dryness exclusively in stainless steel tanks. Red wines are fermented in small, open fermenters and hand plunged. Small parcels are given extended maceration and a further portion are barrel fermented to create wines with finesse, multi-layered flavours and complexity. Individual blocks and treatments are kept separate throughout their maturation of twelve to twenty four months in a varitey of French oak. Malolactic fermentation proceeds naturally in the spring. Presiding over gently undulating grazing lands with sprawling forests in the distance, Crawford River has paved the way for the industry in what is traditionally a wool, beef and dairy region. The cool southerly latitude together with the maritime environment, complex soil structure and favourable micro-climate create a terroir which has justified that initial vision. 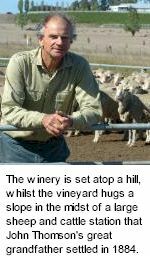 The winery atop the hill and the vineyard hugging the slope nestle in the midst of a large sheep and cattle station that John’s great- grandfather settled in 1884. The splendid site enjoys its moderating maritime influence whilst managing to escape most of the Autumn sea mists. The combination of these factors produces a long and even growing season helping to produce grapes with intense fruit flavours and high natural acidity. Whilst the dry grown vineyard enjoys low yields, some years require careful manipulation of bunch numbers, ensuring the highest possible fruit quality. Budburst is usually mid- September with picking from mid April to mid May. Riesling and Cabernet Sauvignon are the two main varieties in the vineyard, with smaller plantings of Cabernet Franc, Merlot, Semillon and Sauvignon Blanc. All the pruning, picking, shoot and fruit thinning, leaf plucking and general canopy management are done entirely by hand. Due to the long ripening period and consequent late picking dates, there can be an onset of Botrytis Cinerea. In these years the ability to hand select botrytis affected fruit is crucial, as the dry table wines can only be made from clean fruit. The sweet, botrytised fruit is reserved for the estate's renowned dessert wines. These are fermented to comparably low sugar levels in order to find an ideal balance between sugar, acid and alcohol so the purity of the style is expressed with a clean, crisp finish.